Dawn broke to a mild morning for race 2 of the Rasdex Prologue Series of 2018. 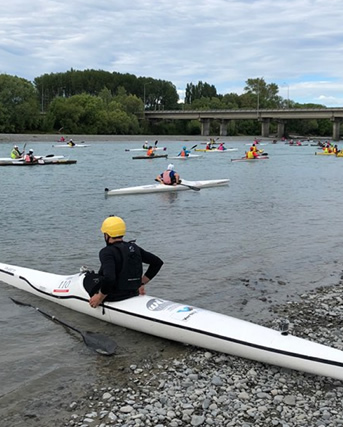 The races, usually held on the upper Waimak, have a loyal following of Multisporters’ prepping for the annual Coast to Coast race, novice paddlers sharpening their skills, as well as specialist kayakers wishing to battle each other through the maze of river braids. Unfortunately the greatest enemy of the Rasdex race series, the famous Canterbury Norwester, had come hurtling over the Tasman and smashing into the southern alps over the previous 24hours, dropping heavy precipitation. These weather events often result in floods that affect the river bed, like God picking up a giant etch-a-sketch, shaking it and then turning the knobs wildly again, etching fresh silvery lines though the Greywacke riverbed. To stay ahead of this bank of flood-water, the race directors opted to shift proceedings to the lower Waimak Bridge, racing down toward the Southern Ocean and back upstream to finish at the town of Kaiapoi. Once the pre-race chat had subsided and everyone had established that they ‘haven’t been training much’ and ‘have been battling a rare strain of influenza’ the 76 paddlers shimmied into their vessels. With the top three racers from race 1, Steve Armstrong, James Feathery and Sam Mason absent, and a transfusion of new talent, it was going to be an especially interesting battle for the open men. Paddlers circled like seagulls, harnessing the river-current to try and hit the rolling start with just the right timing, a task made difficult with the ever building wind, muffling the loudspeaker, held by Len Smyth of TopSport Kayaking. The novice men and women were released first, forming a giant cluster, for the open paddlers to navigate through. The resulting insecurity of having open racers pass at warp speed, has traditionally provided motivation for novices to train harder. Of the open men contenders, hitting the start line with perfect pace and timing were, previous national Marathon K1 Champion, Sam Newlands, and Ryan Kiesanowski fresh off his win at the Twizel Hard Labour Multisport race. Caught wistfully floating downstream sideways was myself, and somewhere upstream, was Sam Goodall, a previous winner of the Rasdex Classic, Main Event. Ryan lead the charge furiously through the cloudy water, with Sam Newlands in toe, I burnt a few matches to catch up and jump on Ryan’s wash, where Sam and I waited for Ryan to run out of enthusiasm, which he did before kilometre 2. Sharing leads to build a gap Sam and I then battled into the tide and wind to try to break each other. Feeling very comfortable I had high hopes for taking the top spot, however firing and exhausting all my rockets 300m out from the finish line left Sam open, with a more strategic sprint, to take the line honours. A couple of minutes later followed ‘Paddling Stalwart,’ Devon Burchett, Ryan Kiesanowski and Sam Goodall, who possibly stopped to buy whitebait on the way upstream. Of the open females, Kate Cambie, also desperate not to jump the start gun, was left upstream when the start was called, getting jumped by fellow contenders, Isla Smith and Fiona Dowling, who hit the start with impunity. Working hard to Bridge the gap, Kate, Rasdex race 1 winner, reeled the ladies in by kilometre 3, amassing a sizeable lead over the rest of the race. Isla, a locally based adventure racer, put the burn on Coast to Coast contender Fiona Dowling, to take out second place, Fiona coming in third. In the novice females, Antonia Yarnton, battled Becky Clarke through the wind-swept chop of the lagoon, with Becky giving up chase and succumbing to pain from injuries she sustained while riding her bike last month. Kate Cambie while passing, and seeing Becky’s distress suggested it was time to quit, which induced some sort of rage fuelled mindset, propelling Becky back up the field and into first place, establishing herself as the top novice, and also someone to be slightly afraid of. Antonia crossed the line seconds later, followed by Lisa Jones, in a commendable third place. Novice Male; 1st. Jeremy Edwards. 2nd. Roland Eveleens. 3rd. Mark Munro. Veteran Female; 1st. Sarah Helmore. 2nd. Tania Leslie. 3rd. Steph Craighead. Veteran Male; 1st. Hayden Prattley. 2nd. Stephen Bennett. 3rd. Nathan Walsh. Classic Male; 1st. Devon Burchett. 2nd. Mark Threadgold. 3rd. Tony Mcguire.